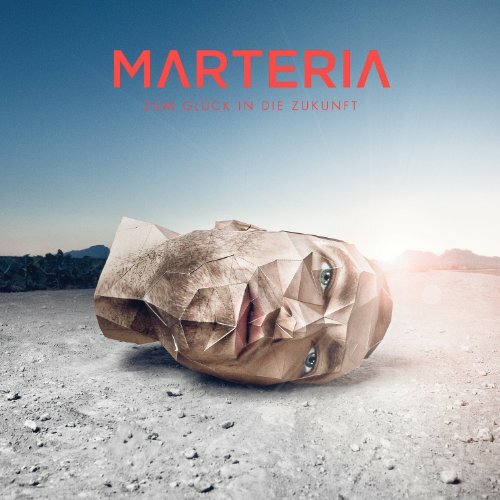 The opening track of ZUM GLÜCK IN DIE ZUKUNFT, Marteria's second album (or his fourth, if you count the two Marsimoto excursions), is simultaneously a perfect introduction to the record and a somewhat misleading one: "Endboss" is a catchy song with an infectious electro beat, a rapped autobiography that cleverly compares Marteria's life (or anybody's, for that matter) to a video game where you complete levels of varying difficulty and use up your extra lives as you make mistakes. But while it's representative of the whole album in terms of production quality and sense of humor, it sets up unrealistic expectations, since none of the other tracks are as joyfully poppy or as instantly accessible. That doesn't mean the other 11 songs are a disappointment, though: production-wise, the album is original and constantly exciting, from the video game bleeps of "Endboss" to the dreamy synths of "Verstrahlt" and "Amys Weinhaus," the acid-drenched bassline of "Wie mach ich dir das klar," the skewed beat on the noise-filled "Alles verboten," or the deep bass hits of "Veronal," which could be a Wordsound production with its echoey drums and slower-than-slow tempo. And while Marteria's slightly wicked humor may not be everybody's cup of tea -- especially since he keeps a straight face throughout the record, sometimes leaving the listener unsure if something is meant as a joke or not -- he is thankfully a million miles away from the violent, low-brow machismo that informs so many other German rappers' songs. Among ZUM GLÜCK's highlights -- apart from "Endboss" -- are the edgy "Alles verboten" (where Marteria claims he does unpopular things like sleeping through a Bruce Willis movie or disliking the Simpsons) and the closing track "Sekundenschlaf," featuring Seeed's Peter Fox, which is a dark reflection on life's brevity: "You're not as old as you feel, you're as old as you are." With an instant hit and several tracks that reveal their strengths after a few more listens, ZUM GLÜCK IN DIE ZUKUNFT is a winner that showcases Marteria's fairly unique musical personality. This review was written for the All-Music Guide and first published on June 14, 2011.